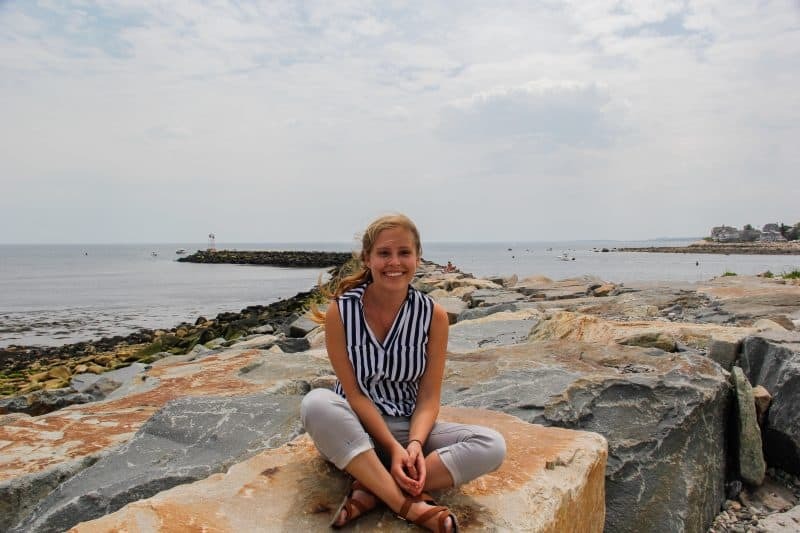 Focus on the Environment Ellen Kanzinger's summer internship allowed her to work on films for the nonprofit GroundTruth Project in Boston, Massachusetts. Ellen Kanzinger ’18 on assignment at the Scituate Lighthouse in Massachusetts. Where did you intern this summer? The GroundTruth Project in Boston, Massachusetts. I received the Todd Smith Fellowship from the journalism department to support this internship. The GroundTruth Project is a non-profit media organization committed to developing young and upcoming journalists through in-depth multimedia projects. GTP reporting focuses on environmental and human rights issues around the world. This summer I am working with the GTP film team on a variety of projects. Part of my job is to assist editors on the post-production of a few short films. But the internship also provided for a lot of flexibility to work on a project of my own. Kylee Sapp ’18 and I did a lot of research on environmental issues in the area and spearheaded a project that we were interested in. Because GroundTruth’s mission is to get journalists into the communities they are reporting on, we have spent a lot of time traveling up and down Massachusetts’ coast to meet with various sources. We made it up to Newburyport and Gloucester, and later spent some time down in Woods Hole and Groton, Connecticut. Since GTP focuses on in-depth projects, I only worked on two stories during my time here. But Kylee and I were able to really dig deep into a story about the Northeast Canyons and Seamounts Marine National Monument off the coast of Cape Cod. Designated toward the end of President Obama’s term, the monument protects about 4,900 square miles of ocean from all commercial extractive activities, including commercial fishing. This has caused a lot of controversy because many in the fishing community feel the president overstepped his authority and did not provide enough time for public comment on the area. However, many scientists and conservationists have been advocating for increased protection of marine resources for environmental and scientific reasons. President Trump recently ordered a review of a number of national monuments around the country to determine if the designations fell within the legality of the Antiquities Act. We talked to people all over the area who had a personal and professional stake in the monument designation. The final project includes several components, including a written piece, video and photographs. In reporting on the monument and how it will affect the New England fishing industry, we met a lobsterman out of Boston Harbor who has been catching lobster for about 60 years. He took us out one morning so we could see what an average day for him looked like. We left the dock at six in the morning and spent the next eight hours documenting the lobstermen as they pulled in trap after trap. By the end of the day, they hauled in more than 250 traps and caught 158 lobsters. The captain of the boat spent the entire trip walking us through what they were doing and various aspects of the fishing industry. I was struck most by how open and honest he was with us about his job and the struggles he faces on the water. It served as a reminder about how important it is to report the story to the best of my ability by getting out into the community and talking to the people these issues affect. The biggest challenge for me was the scope of the project. Most of the reporting I had done in the past was on local stories that I turned around in a couple of days. With this project, I had to find sources who could help inform my story in an area where I had no previous contacts. I also had to think about how to represent the story visually through video and photographs, especially since the area we were talking about is in the Atlantic Ocean, 150 miles off the coast of Cape Cod. Luckily, the GroundTruth team was supportive of our project and everyone had suggestions on people to talk to or ways to structure the story. Once Kylee and I broke the story down, we were able to work through sources and research piece-by-piece. What did you like most about the location of your internship? I’ve never lived in a city before, so I was excited to be in a place like Boston for the summer. I love history and have done the Freedom Trail multiple times. I also went to a dramatic reading of the Declaration of Independence on July 4. Really, I was just excited to be in a place with so many things to do and different restaurants to try. I think I am finally getting used to the public transportation system in Boston. In the past, my journalism experience has been geared toward the daily production of news. I spent the summer after my freshman year as a photojournalist with my hometown newspaper. But this internship allowed me to explore a long-form style of journalism that focused on producing a single story over 10 weeks. I am now more interested in pursuing future in-depth visual stories that combine different media in order to really explore the complexities of a story. The journalism department at W&L requires students to take 72 credits outside of the major. So while I learned a lot from my journalism professors, such as how to interview your subject or file a FOIA request, I’ve also had the opportunity to explore areas of interest outside of my major. My liberal arts education has heightened my curiosity for learning about and experiencing new ideas to better inform my thoughts.